This update is Version 1.31F. See the PsiLog History page for details of the features and bug fixes for each version of PsiLog. The PsiLog update does not include an update for PsiLog Link. See the separate PsiLog Link update below. Unpack the Update file into the directory on your PC specified by "Update directory" under "Remote link preferences" in PsiLog. The default is your C:\TEMP\ directory. Start the Link Server software on your PC and connect your Workabout to your PC. Select "Update PsiLog" from the "Special" menu in PsiLog. When the update is complete, you may delete the unpacked files on your PC. You can also delete the packed update file too, unless you want to keep it. Please note that the following suggestion will only work for PsiLog Install Disks V1.15F or later. Using it on install disks earlier than that will overwrite important installation files and you will have to contact SCSS for a new Install Disk. With the new Windows install system there is now enough space on the floppy disk to hold both the complete Setup package AND the unpacked Update files. A possible arrangement might be to unpack the Update files on to the install floppy disk, keeping all the PsiLog files together. You can then change the "Update directory" in the "Remote link preferences" dialog to be REM::A:\ (or REM::B:\ if your 3½" drive is the B: drive). This way PsiLog can perform an update directly from the floppy disk. Versions of PsiLog earlier than V1.15F came with a Link software package called "RCOM". This was a DOS-based package and many customers had problems using it on computers with Windows. There were alternative Windows software packages, such as "EPOC Connect Lite" and "PsiWin". These solved the Windows compatibility issues, but were rather large to download and install. 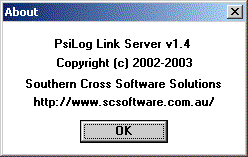 Starting with V1.15F, PsiLog comes with a new Windows Link software package called "PsiLog Link". This fixes the Windows compatibility issues. If you have installed "EPOC Connect Lite" or "PsiWin" solely to correct compatibility issues, then you should uninstall them before installing "PsiLog Link". PsiLog Link version 1.2 and earlier can exhibit problems connecting to the Psion computer, particularly under Windows 98. Version 1.3+ of PsiLog Link is distributed with PsiLog V1.19F and later. If you're having troubles connecting, download and install the above update.